friends. The prospect of joy and pleasure flows through the air. Teenagers and old rockers will soon awake from their hibernation and huge nomadic crowds of music lovers will occupy fields far and wide. On at least a few of these fields One Armed Man should be present, preferably at night or in a tent. Why? Well, mostly because this is some good rock music, borrowing from several genres to create something that will be perfect for these evenings. One Armed Man is a French quintet, consisting of talented musicians and songwriters. Black Hills is their second output, after a six-track e.p. The most striking element is the blend of unobtrusive rock genres. One Armed Man seems to borrow influences from classic rock, new wave, post-punk and shoegaze, both in the music and in the vocals. Vocalist (and guitarist) Pierre adds the perfect voice to this dreamy rock, making the whole very enjoyable and soothing. In most songs the vocals are mixed towards the background, making them function more as an instrument. There are elements from shoegaze and post-rock but also from alternative rock in the line of Pixies and Jesus & the Mary Chain. Some of the songs are uptempo rock anthems, yet, just like the slower ones, they have a modest and subdued wall-of-sound element. This aspect makes a song like 'Mad Season' awesome, to be enjoyed at any volume level. On 'Black Swan', a beautiful rock ballad, One Armed Man incorporates influences from country or surf music, two genres that have a warm atmosphere. The country element grows bigger on 'Back Home' which could easily be described as a modern country song and a solid candidate for best country song of 2015. 'Lullaby' is a nice instrumental intermezzo, perfectly followed-up by another uptempo country rock track, 'Cold Rain'. 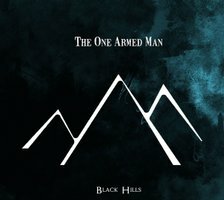 On 'My Own Gold', One Armed Man chooses a different path. Here the classic rock influences become clearer. I can imagine some of the members having listened to Led Zeppelin while driving toward the reheasal studio. These are just a few examples of the high quality songwriting skills One Armed Man possess. The whole album gurgles forth in a calm, gentle way and feels like the soundtrack a warm summer evening. This music is perfect to listen to after a day of over-distorted guitars and roaring vocals, to calm down after an afternoon of dancing or headbanging. Just lay down on your back in the tender grass of the festival ground and let yourself flow with the beautiful musical stories of One Armed Man. However, don't forget, they can rock as well.